Hitachi America, Ltd. announced the newest expansion to its Collegiate Series line with the addition of two new 3LCD laser projectors. The LP-EU5002 and LP-EW5002 feature a host of advanced features, making them the most anticipated addition to Hitachi’s growing line of laser projectors. Both the LP-EU5002 and the LP-EW5002 offer 5,000 ANSI lumens of brightness with resolutions ranging from WUXGA 1920×1200 to WXGA 1280×800 respectively. These maintenance-free operation projectors have 20,000 hours light source life and up to 50,000 hours with Long Life 2 mode. Both models have multiple digital inputs (HDMI and HDMI/MHL), 3LCD projection technology, and a contrast ratio of 500,000:1. They are equipped with 360° installation, a 1.6x zoom lens, and Perfect Fit 2, which helps integrators save time during installation. 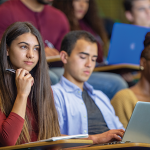 All Collegiate Series projectors are eligible for Hitachi America, Ltd.’s OneVision Program for higher education facilities, providing colleges and universities with specialized pricing, enhanced service and warranties, direct access to Hitachi experts and program rewards. The buying rewards of the program include the option of buying 10 projectors and receiving a free projector, or buying three projectors and receiving one lamp free.